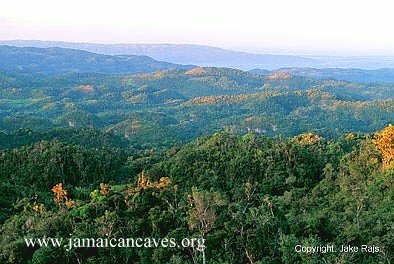 The JCO has recently entered into a contractual agreement with The Nature Conservancy of Jamaica to carry out the cave component of the Parks in Peril Project, in the Cockpit Country of Jamaica. This page is being established to serve as a conduit for news and information on our plans, and our progress, and as an introduction to the nature and history of the project itself. Our involvement with this project began in late 2001. R. S. Stewart, who would soon become the founder of the JCO, was invited by Dr. S. Koenig, of the Windsor Research Centre, to assist in prep work for the cave component of the Parks in Peril Project, then in its nascent stages. Despite the fact that there was no actual funding at that point for the cave component, a team that consisted of Susan Koenig, Stefan Stewart, and Martel Taylor, carried out work in February of 2002 that would establish a methodology that would eventually become the base for future assessment purposes. In June, 2002, TNC-J funding enabled further work, this time under the guidance of G. O. Graening, of The Nature Conservancy in the USA, with the assistance of Susan Koenig, Stefan Stewart, and Martel Taylor. A number of caves were visited, and good work was done. During 2003, Mr. Stewart, with the assistance of others of the JCO crew, continued to actively visit and study caves, using the work done in 2002 as a template for our own work. Further refinement was done, with the help of Dr. S. Koenig and Dr. D. McFarlane, on the systematic approach to our speleo work first formulated in 2002. In 2004, Mr. Stewart began an assessment project of the caves of St James, under NEPA permit, that was based on the early Parks in Peril work. There was no funding, other than what Mr. Stewart could supply himself, but with the help of volunteers, principally I. C. Conolley, M. Taylor, Mark Bellinger, E. Slack, and D. Roggy, over 50 caves in the parish were visited and systematically investigated. In August of 2004, the JCO was contacted by TNC-J with regard to carrying out the cave component of the Parks in Peril Project, in the Cockpit Country. A proposal was submitted, after the Terms of Reference were received in the autumn of 2004, and this was met with a positive response by TNC-J, although no definite word on contractual arrangements was to be forwarded to the JCO during the course of the rest of the year. In late 2004, Mr. Stewart applied for an expanded permit from NEPA, that would extend his own research project to include sampling of undescribed cave-adapted invertebrates, in collaboration with several international scientists. Because the work in St James was still not finished, but anticipating that it would be done by mid-year and it would be desired to move onto a new parish, that being St Ann, the application was extended beyond the original perimeter of the 2004 permit. In addition, in hopes that the proposal submitted to TNC-J would be successful, permission was sought from NEPA to include all of the caves located within the Cockpit Country ring-road. In late January, 2005, within the course of several days, the JCO was informed by TNC-J that our proposal had been accepted, with Mr. Stewart acting as the Principal Investigator, and Mr. Stewart was informed by NEPA that his 2005 research permit had been approved. This brings us to mid-February, 2005, the time of the writing of this account. In the days to come, information on the specifics of our work on the cave component of the Parks in Peril Project will appear on this page. For now, interested parties are invited to read our proposal that was submitted to TNC-J on Nov 5, 2004. The budget and appendices have been stripped out, but it gives a good overview of what we intend to accomplish. We will go into further detail on this page in the very near future. The current planned schedule has us beginning this systematic investigation of over 70 caves in the Cockpit Country in early March, 2005. It is hoped that the actual field-work can be done in two sessions of two to three weeks each, with completion by late April. The deliverables, i.e. databases, notes, hardcopy report, Arcview project files, will be ready to go by June 1, 2005. We have not underestimated the degree of work required to complete this project. It will not be easy. We will spend many long days underground. Nevertheless, we intend to do a good job of things, and produce the first large-scale systematic base-line inventory of the caves of Jamaica done since the Geological Survey Dept work of the 1950's. We ask patience of those many people who contact us with reports of caves and sinkholes, and with inquiries into assistance with caving in Jamaica, and with requests for help with GPS and datum problems, and all the rest. Some emails may take longer to get answered than would be preferred over the next few months.